What is your reputation? How do people recognize you and what do they tell others about you. Ruth had a reputation already, and she had only been in the area a short time. Read Ruth 2:6-7. 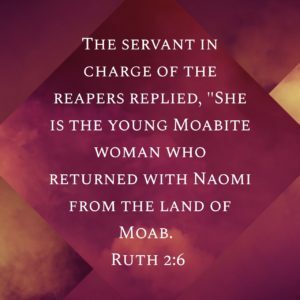 The servant in charge of the reapers replied, “She is the young Moabite woman who returned with Naomi from the land of Moab. Boaz was asking about this new woman and his servant shares with him about Ruth. He knows her story and shares that. If others were to ask someone about us, what would they say? Would they know and understand who we are and what are about? What would they tell others about us?